Finally finished up watching the rest of the show. And then some, actually, because I was away from it for long enough I just decided to start back from the recap episode, which I definitely think helped me ease back into things. Overall I'm really satisfied with it. R/B had the odds stacked against it between not getting official subs and being the designated "goofy" series after the rather serious Geed, so I can only hope it gets the recognition it deserves for being just as good as the last few Ultra shows. I tried stressing this in several of my posts about individual episodes, but R/B is deceptively simple. Despite the lower stakes and a general laid-back tone, it's extremely clever and clearly made with the same amount of love and care as any of its contemporaries. The show sells itself on being offbeat, and on that front it succeeds spectacularly due to a winning combination of perfect comedic timing, and an ability to mess with the franchise's traditions without losing its spirit. It's very much The Un-Ultraman Show in a lot of ways, and because of that it feels super fresh. I cannot stress enough how entertaining the dynamic between Rosso and Blu is. There's just nothing like it anywhere else in the franchise. And even when they aren't transformed, Katsumi and Isami are great together. The family drama at the core of the show is another huge point in its favor, coming off as genuine and heartfelt rather than cheesy and trite, and despite nominally being a show about two brothers, the entire family gets their share of the spotlight. Asahi especially became one of my favorite characters in the show pretty quickly, which I was NOT expecting at all, and on top of all that, R/B also has two excellent, and fairly atypical main villains who elevate the show that much further. 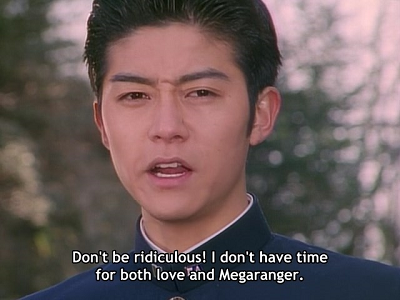 I have a few complaints, namely specific things I felt could be done better, such as Katsumi and Isami running around talking about their duty as Ultramen in the last few episodes, which I get, but I still think it ruins how utterly perfect them specifically saying they aren't Ultramen just a couple episodes earlier was. Gripes like this are minor when looking at the bigger picture, though, and in a lot of ways R/B exceeded my expectations. I was pleasantly surprised to find out Ruebe didn't dominate the fight scenes the way I thought he would, for example. R/B is a darn good show that totally stands on its own merits, and because of that I can easily recommend it both to Ultra fans and to people who've never given the franchise a shot before.